The unemployment rate represents the ratio between unemployed workers in relation to the total labour force. This indicator gives the overall unemployment rate. This indicator measures the quality and performance of urban labour markets. It constitutes an important contextual indicator to assess regional flexibility as well as sustainability of local economic activities. From the regional level analysis we know that in the BSR the biggest change in unemployment pattern has been improving in Poland and worsening in the Baltic States. 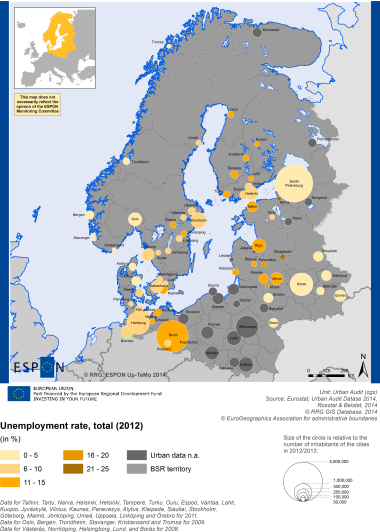 The urban analysis shows that the cities with the highest levels of unemployment are Narva, Riga, Kaunas, Berlin, as well as many smaller cities in the Baltic States and Finland. Helsinki, Tallinn and Vilnius are the exceptions in the Eastern part of the BSR, while many cities in the west are doing generally well. St. Petersburg reports low levels of unemployment, as does Minsk. Unfortunately there are no data for the Polish cities. Turning to the unemployment change, Riga is experiencing a large increase in unemployment, along with large cities like Copenhagen and Uppsala. Some smaller cities in Estonia, Latvia and Lithuania also show negative trends. Helsinki, Stockholm and Berlin show strong improvements, as do many cities in Denmark and Germany. As for other indicators there is a lack of data for many cities, in this case notably in Norway, Poland and Finland (as for Ru/BY).